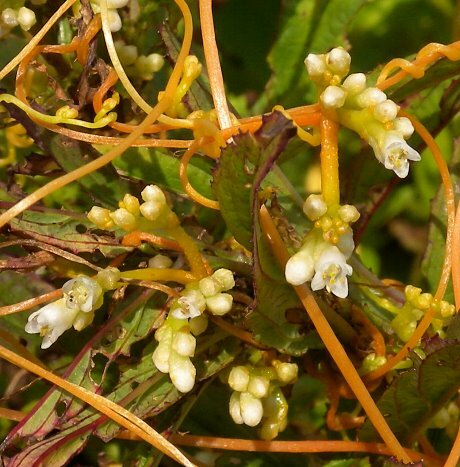 Cuscuta polygonorum.John Hilty.www.illinoiswildflowers.info (Accessed 7/2014). Cuscuta polygonorum is a parasitic annual herb, orange-stemmed vine, closely entwining host plant and entering host by numerous haustoria; vines strongly phototrophic, climbing only upward and counterclockwise, forming tangled masses at top of host stem, seedling root system degenerates when haustorial connection to host formed. Leaves none or scale-like, alternate. Flowers white, 4-parted, 0.2 cm, petal lobes triangular, tips pointed, calyx lobes as long or longer than petal tube, tips very blunt; inflorescences of small, dense clusters. Fruit dry, hollow capsule, whitish, rounded, cupped by withered flower parts, 0.2 x 0.3 cm, persistent into winter, massed at tops of host stems; seeds 2-4, about 0.1 cm. Habitat: In open areas on other herbs, occasionally on shrubs. Notes: May kill host. Listed as a noxious weed by the USDA (USDA 2004).